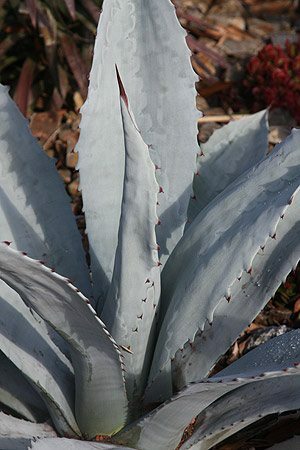 Agave are popular with landscapers for the strong structural elements that many species bring. In many areas of Australia Agaves will provide excellent architectural foliage all year round, however in colder climates they can suffer a little in winter. Agave are widely used in both containers and in the ground. In container as a single specimen Agave have naturally strong sculptural shapes and work well in modern courtyards as commercial landscaping. Also popular in home gardens where the low maintenance aspect of these plants fits in well with busy modern lifestyles. Foliage varies from blue greens through to strong variegated types. Size also varies from diminutive species to large dramatic plants. A. attenuata – Good tight pale to mid green rosettes of foliage. One of the most popular species, also known as the foxtail agave. A. franzosini ‘Grey Ghost’ (pictured right) – This is an outstanding large growing, if rare specimen. A. medio picta alba – Good variegated foliage, an excellent plant to add contrast to the landscaping scheme. A. stricta – Smaller growing with fine foliage. Tends to form a neat ball shape. A. americama – Large growing with fairly upright foliage. Blue green in colour and an excellent feature plant. Large specimen plants are available to provide instant impact. Many species are well suited to growing in containers. These are a low maintenance, easy care plant. Lots of new named cultivars are also available, however the species are attractive and will suit most situations. Agaves will flower, usually in winter, and flowers vary from rather insipid types to colorful large flower spikes that rise high above the foliage. As far as foliage plants go, to Agaves are a better proposition than Aloes. Agave plants are available for sale from the following wholesale nurseries.